Welcome to Avanti Circuits, the #1 manufacturer of USA-made printed circuit boards. Avanti has been providing high quality, quick turn circuit boards to the electronics industry for over 35 years and is trusted by some of the biggest names in the world, including Boeing, GE, and NASA. Manufacturer-direct pricing and support, combined with the highest quality materials and most advanced PCB fabrication techniques, is what sets Avanti Circuits apart from other PCB suppliers in America. Printed circuit boards may not be the most expensive components your business purchases, but they are certainly among the most important. The capabilities and performance of the electronics you manufacture is directly dependent on the capabilities and performance of the circuit boards inside, which means the success of your products (and ultimately your business) is linked to the PCBs you order. 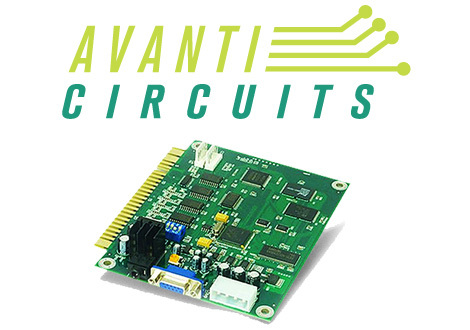 Avanti understands this connection, which is why we strive to produce the very best printed circuit boards available in today’s PCB market. We consistently offer the most competitive pricing in the industry with no hidden fees or additional charges. Request your free online PCB quote today to see how much you can save! We understand that your business is time sensitive. We also have a long track record of meeting our deadlines and keeping our commitments. We are ready to serve you. Our management staff has over 200 years of combined PCB manufacturing experience at your disposal, and we’re happy to consult with you on the design and specifications of your circuit boards. Whether your needs include high density or layer counts, exotic materials or finishes, we have in-house PCB manufacturing capabilities to meet them. We stand behind our work 100%. We have the experience and expertise to meet your PCB requirements, even to the most demanding specifications and standards. Whether you need prototype or production PCB quantities, we can satisfy your needs. We are committed to acting with uncompromising honesty and integrity in everything we do. These advantages have allowed us to continue to be successful in a market that has seen the closure of 90% of the US-based PCB manufacturers. In the late 90’s there were over 2,500 PCB manufacturers in the United States. As domestic demand declined, most of them have gone out of business. We have heard many stories from customers that have had to find new suppliers after theirs shut down, only to have to go through the process again after a new supplier also shuts its doors. We understand that the process of qualifying a new supplier, establishing a working relationship, and tooling for your needs can be frustrating, time consuming, and expensive. That’s why we’re proud of the fact that we’ve been supporting the needs of PCB users since 1982 and are more financially stable now than ever before, which means we will be available as a partner to support your immediate and long-term needs. The printed circuit board is typically the most critical component of any electronic assembly and the most difficult to procure. Like the foundation of a house, your product is only as good as the PCBs that are used to produce it. Reliability is critical to the success of your product, and we do everything necessary to insure that our part of your product is flawless. From design review to manufacturing to quality control and testing, you can rely on our experienced team of printed circuit professionals to produce products that you can count on without hesitation. Avanti has a proven track record of reliability, quality and on time delivery. For most of our customers we are either their primary source or in many cases their only source for printed circuits boards. Thank you for your interest in Avanti Circuits. If you would like to get to know us further and learn what we can do to help address your specific PCB needs, please contact us online or call us toll-free at (888) 595-8876. We welcome the opportunity to speak with you, to earn your business by demonstrating our capabilities, and to contribute to your success by providing a reliable, cost effective, and long-term partnership. We hope that you will join us as a valued customer.